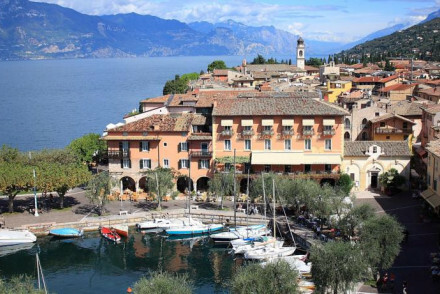 On the eastern shore of Lake Garda, Torri del Benaco is a pretty town behind a tiny little harbour overlooked by a wonderfully atmospheric 14th Century Scaligero castle. The castle was built using the town’s original 10th Century fortified wall. This lack of wall improves the view from properties which have now been converted to become some of the best places to stay in Torri del Benaco. Some of these were the 16th Century palazzi built during the town’s most prosperous age and arranged along the town’s cobbled main street. Castello Scaligero is a beautiful 14th century castle that now functions as a museum focusing on the town and lake's history. Chiesa dei Santi Pietro e Paolo is astunning church famous for some magnificent painted ceilings as well as altars by Tomezzoli and Benedetti. Some of the other properties on our Guru's list of the best places to stay in Torri del Benaco can be found just out of town on the hills overlooking this little charmer. Gardesana offers comfortable rooms, great views and excellent food. It’s also wonderful value with room starting from under £100 per night. A romantic spot. Just along the lake from Torri del Bencao is the Locanda San Vigilio. An elegant hotel owned and run by an Italian Count! It has been a hotel for 500 years and is immaculately decorated with antiques and beautiful objects. Converted from an 18th Century farmhouse the Locanda San Verolo has twelve rustic chic bedrooms, a heavenly pool and fragrant gardens. There’s a great restaurant and you’re just outside the medieval town of San Verolo. The nearest airport to Torri del Benaco is Verona (32 miles). Hiring a car is a great option for exploring the town and surroundings. Explore the options at our online partner Rentalcars. The best time to visit Torri del Benaco is in the summer months, when the temperatures sit comfortably in the twenties. Browse though our list of all the best places to stay in Torri del Benaco.